Experts have been predicting the demise of car ownership for a long time now. They see a future where the majority of city dwellers get from A to B on public transport, bicycles, or by renting a shared car (probably self-driving and electric) via their smartphone. But in some cities in the developed world, the car is already in decline. 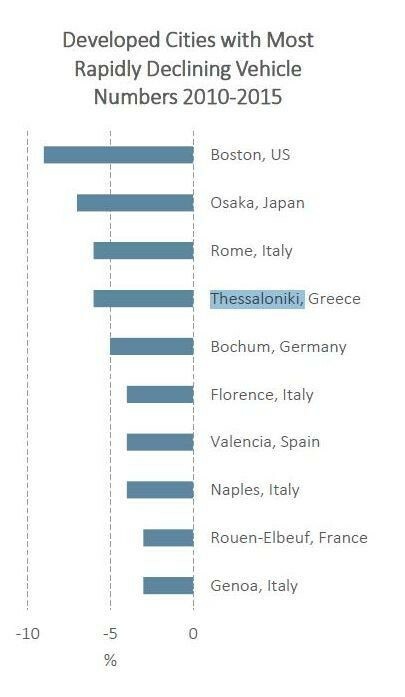 Euromonitor International’s Top City Destinations Ranking includes a section on cities that saw the biggest falls in car numbers between 2010 and 2015. According to the report, Boston saw the biggest reduction, with around 9% fewer cars during the five-year period. Osaka was next with roughly 7%, and then Rome with around 6%. The Euromonitor report says the fall in car use in these cities is partly because people are opting to live in city centres instead of the suburbs, and are choosing to walk or cycle to work. It also notes the rising popularity of alternatives to ownership such as car-sharing and ride-hailing services such as Uber and Lyft. At the same time, countries including the US , UK and Australia have recorded a drop in the number of people obtaining driving licences. Change is also being driven by city authorities. Traditional urban transport systems are being modernized with the use of smartphone-integrated solutions, such as apps that tells you when the next bus is due to arrive at your nearest bus stop. 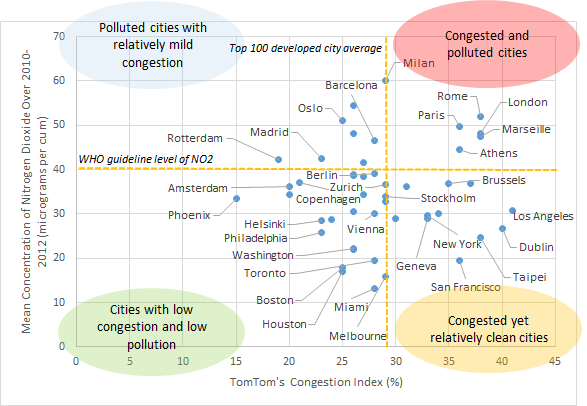 Despite this trend, some developed cities are still blighted by congestion and air pollution, as the chart below shows. Rome, where passenger car numbers fell by 6% between 2010 and 2015, was declared Europe’s fifth most congested city in 2015 in a report by TomTom . The report says authorities are turning to innovative urban planning and alternative forms of transport as a way to tackle congestion and air pollution. In Miami and Boston, for example, more restaurants, shopping and entertainment venues have been popping up in locations that are accessed most easily by walking and/or on public transport. Many cities have also grasped the social, health, economic and environmental benefits of cycling and have invested in infrastructure to support it. 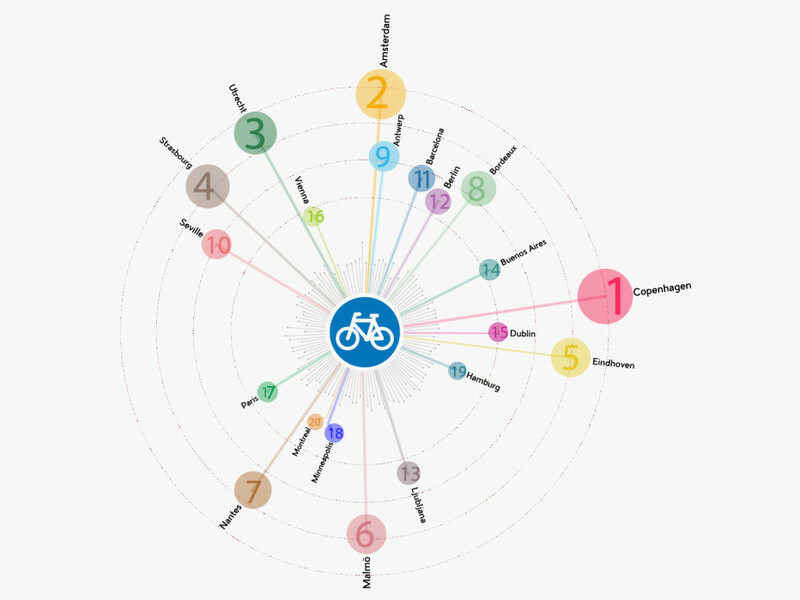 In 2015, Copenhagen, the world’s most bike-friendly city , reported that, for the first time, the number of bikes entering the city centre daily exceeded the number of cars . Over the year, 252,600 cars and 265,700 bikes made their way into the city every day.